Standard Coco Replacement Liner for Standard Size Hayracks - 42 Inch by Windowbox at Tulips Orchids. MPN: BXI-K-500ADL-42. Hurry! Limited time offer. Offer valid only while supplies last. Extra thick replacement molded coir liners for wall troughs, window baskets and hay racks can last twice as long as standard non-molded coir liners. Extra thick replacement molded coir liners for wall troughs, window baskets and hay racks can last twice as long as standard non-molded coir liners. Fits our standard size (not-XL) English Garden and Scroll Window Baskets. 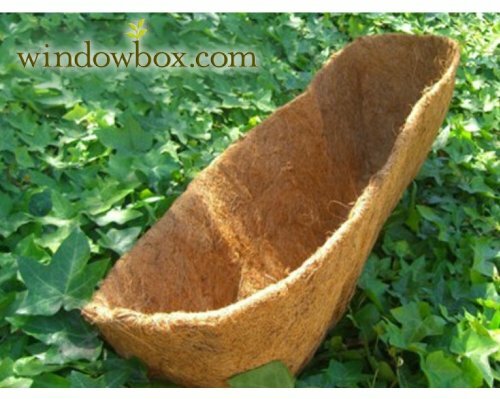 MagniMoist Basket Liner Fiber for Plants (Pack of 2), 12" x 19"
Replacement Coconut Coir Coco Liner for Hanging Basket - 18"